Can a person repally walk themselves back to being a good person? That’s exactly what Cheryl Strayed tells her friend she is going to do by walking 1000 miles on the Pacific Crest Trail. 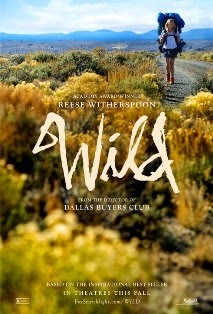 Wild, starring and produced by Reese Witherspoon, is based on Strayed’s 2012 best-selling memoir Wild: From Lost to Found on the Pacific Crest Trail. Wild is unflinching and unsentimental, with a powerhouse performance from Witherspoon. In 1995 Strayed found herself at rock bottom. At age 27 she was divorced due to her constant cheating, using heroin, and she was pregnant. She wasn’t sure how she had turned out that way. At one point she had been happily married and attending college. She wanted to be a writer. So what threw her so far off track? 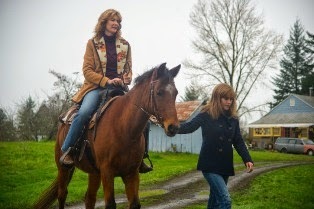 I have not read Strayed’s memoir, but in this film it all seems to lead back to the untimely death of her mother(portrayed by Laura Dern) four years prior. The film doesn’t spend a lot of time dealing with the whys of Strayed situation. Her back story is shared via flashbacks as Strayed recalls events in her life as she hikes. We see a lot of traumatic events, an abusive and alcoholic father, the financial struggles of her single mother, and ultimately her mother’s sudden diagnosis and subsequent death from lung cancer at the age of 45. It’s certainly sad, but nothing that would guarantee the wayward path Strayed put herself on. Wild is best when we are following Strayed on her journey along the PCT (as the Pacific Crest Trail is known as). Her overloaded pack, inexperience with camping equipment, and ill-fitting hiking boots are relatable to anyone who has dabbled in hiking, but hasn’t done anything as formidable as hiking 1000 miles over dessert, mountains, snow, and forests. Strayed didn’t know what she was getting herself into either and it’s fun to discover the trail along with her. If there’s one thing to admire about Strayed it’s her perseverance. She never gives up on her hike despite her total naiveté about the trail. And Strayed is a difficult person to admire. A lot of people deal with hardship and they don’t turn to drugs and promiscuity. But then again some people do, and they never get out of it as Strayed did. What’s interesting is the way Strayed’s back story slowly unfolds. At the outset we just see that she is a single young woman hiking alone. She looks pretty well put together and she’s friendly and polite to the people she meets. There’s no reason to think she’s had a hard time or that there’s a greater purpose to her hike. It could be anyone you meet. If there is one thing I could fault Wild for it’s the lack of real self-examination from Strayed. We see the hike and we see her life before the hike, but we don’t really dig into it. We don’t really get to know Strayed or how she was affected by her journey. We know she got her life put back together because that’s what we are told, and because we know she went out to write her book and tell her story. But we don’t really get to see it. We don’t get to know what was inside her that made her go off the rails and what brought her back. However, maybe it was just about the journey. Though harrowing at times, I enjoyed this film. Witherspoon makes this character feel real. She’s not too cute, too wise, or too bitchy. She has all those things within her, but she seems like a real person. She has good qualities along with her bad ones and that’s what makes it possible to root for her.